The futuristic skyscrapers and lavish hotels of Dubai Marina are even more dazzling by night. 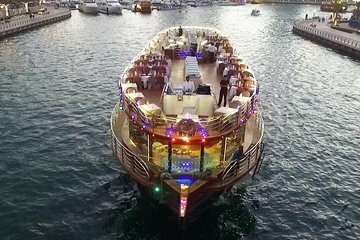 On this evening cruise, set sail on a luxury cruise ship and glide past landmarks including Palm Jumeirah, Atlantis hotel, and Burj Al Arab. While on-board, tuck into a delicious buffet dinner with four courses, and enjoy live music, dancing, and traditional entertainment.